After Elder Centaur attacks, give him Cover. 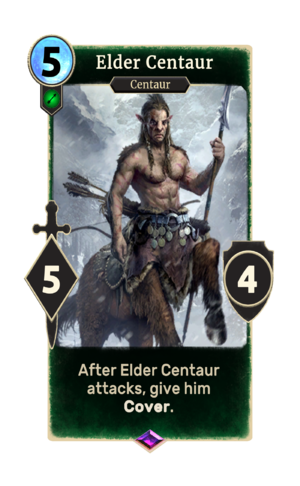 Elder Centaur is an epic Agility creature card. It is part of the Core Set. In addition to the card's availability in the Core Set, one copy is included in the Dagoth's Might theme deck. "The mortals shall tremble before me." "I'll stomp their bones to dust." Centaurs first appeared in Daggerfall. This page was last modified on 27 February 2019, at 21:48.